Habits of Mind: How Do We Know What We Know? 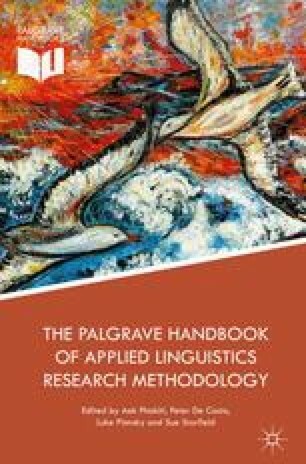 As the contributions to this book attest, methods of inquiry that applied linguists employ differ greatly. Learning and using language is a vast and vastly complex undertaking and any method of investigating it inevitably involves researchers attending to some aspects while disattending to others. The ways that different researchers attend to different aspects of language learning and use are habits of mind grounded in the communities to which they belong. One way of understanding these habits is through the sociology of science pioneered by Ludwik Fleck. According to Fleck (1979/1935), researchers are members of thought-collectives with certain habits of mind that direct researchers’ attention to assimilate what they perceive into what Fleck called a thought-style. I use Fleck’s three characteristics of thought-collectives—their rhetoric, their epistemology, and incommensurability among thought-collectives—to consider different methodologies of applied linguistic research and to describe how different habits of mind constrain how we know what we know. I conclude that, though incommensurability exists between certain thought-collectives in applied linguistics, several researchers have argued strongly for complementarity and I relate experiences of individual researchers whose thought-styles have been changed by attending to new data. Thanks to my daughter Jenni Young for reading and correcting an early version of the chapter. Thanks to Luke Plonsky, Sue Starfield, and Aek Phakiti for helping me craft an essay that feels at home in an encyclopedia. Special thanks to Heidi Byrnes for introducing me to the philosophy of Ludwik Fleck in a discussion during Hulstijn and Young’s colloquium at the 2013 conference of the American Association for Applied Linguistics in Dallas, Texas.